...El Hazard's take on Tenchi Universe. Makoto Mizuhara is a teenager with it all. Brains, looks, and sensitivity. So what if he's clueless? Unfortunately, Katsuhiko Jinnai, president of Shinanome High School, has dark and nefarious plans for our oblivious hero. Jinnai, tired of living in Makoto's shadow, decides to sabotage Makoto's science experiment. This being anime, the device sends Makoto and Jinnai hurtling through time and space. Along for the ride is Nanani, Jinnai's sister and Makoto's childhood friend, and Mr. Fujisawa, the history teacher in all his unshaven, mountain-climbing, alcoholic glory. He's understandably one of the series' most loved characters. 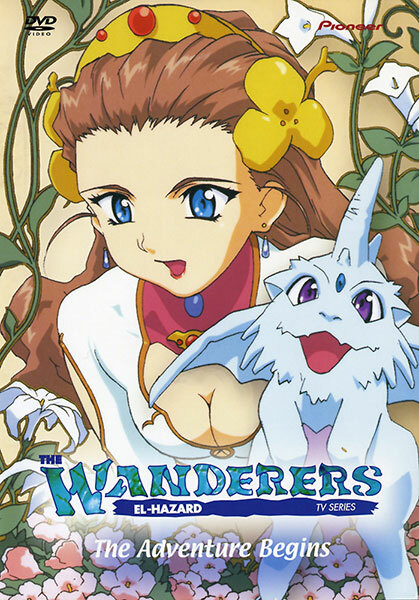 El Hazard: The Wanderers is the product of the same people who brought us Tenchi, and it doesn't disappoint. It leans a bit more heavily on the Romantic part of Romantic Comedy than Tenchi, but it's none the worse for that. It's a sweet, funny, colorful series, with enough romance to melt the hardest heart. And enough humor to cause even the soberest of sourpusses to crack. All of the characters are appealing in their own particular ways. Makoto's an honest hero, Jinnai is the most pathetic, obnoxious, and amusing villain you're likely to find. And Mr. Fujisawa has to be seen and heard to be believed. The series isn't very serious (hyuck, hyuck), so don't expect much depth. Still, compared to Tenchi, it's downright profound. To close, in my opinion, this is one of the best, if not the best romantic comedies out there. Check it out. This is the first TV series and stands completely alone in its plot. In a phenomenon familiar to those who've followed the various versions of Tenchi, the original El Hazard OAVs (The Magnificent World--both series) and the second TV series (Alternative World) are all off in their own unrelated storyline. Available in North America from Pioneer (Geneon) on a hybrid 4-disc box set, or on 4 individual DVD volumes. Was originally available on eight subtitled or dubbed VHS volumes, now out of print. El Hazard: The Wanderers is Copyright © Pioneer Entertainment / AIC. Any images are the property of their respective rightsholders, and included for review purposes only under the fair-use clause of US copyright law.